BAMBOO AUSTRALIA celebrates their 25th anniversary. Established in 1989 Durnford Dart created the first commercial bamboo in Australia, Bamboo Australia’s, Belli Bamboo Parkland which is located along the Eumundi-Kenilworth Rd at Belli Park in the Sunshine Coast hinterland. Having survived extremes of drought, arctic frosts, floods and divorce settlements, the farm is still recognized as Australia’s leading source of bamboo information for growing anything relating to living bamboo plants or the supply of poles and manufactured bamboo such as bench tops and flooring. A range of 250 species of top quality bamboo plants are available to the home gardener or professional landscaper to screen out the neighbours, establish an environmentally friendly hedge or use as a spectacular feature plant. If a living plant is not appropriate then rolls or panels of bleached or black poles can be utilised as well as individual poles ranging in diameters from 10 – 160mm in various lengths. We continually supply bamboo poles for Antarctic expeditions, Womadelaide, Port Fairy festival, Woodford Folk festival and numerous other stage and theater productions in addition to shopfitters looking for an alternative display. Bamboo Australia’s “Belli Bamboo Parkland” is situated west of the popular seaside resort town of Noosa Heads on the road from Eumundi to Kenilworth. If you are using a GPS navigator to get here, please type the address as: 1171 Eumundi-Kenilworth Road, otherwise you will most likely finish up 5 kms away on Skyring Creek Rd. Travel up the Bruce Highway from Brisbane until you get to Exit 224. The signage reads Eumundi-Noosa-Kenilworth-Tourist route 22. Take the off ramp and proceed through the roundabout heading for Kenilworth. the big “Bamboo Australia” sign in the paddock and bamboo growing along the roadside, start slowing down our driveway is the next on the left. There is yet another “Bamboo Australia” sign displayed at the entrance which is opposite the Belli Community Hall. Simply drive in and follow the signs to the office or nursery. How did Bamboo Australia come about? ‘Mr. Bamboo’ is the name by which Durnford Dart is popularly known today throughout Australia. From farmers to manufacturers, related product producers, to purpose cultivation specialists, Durnford Dart is generally acknowledged as this country’s Bamboo growing and marketing expert. After serving 6 years in the R.A.A.F. and building a highly successful business in the Auto Recycling business, his love for the land ( he was raised on a farm ) led him to establish, in 1989, ‘Belli Bamboo Parkland’ located west of the popular seaside resort town of Noosa Heads in Queensland. He is now recognised in the massive Asian Bamboo Industry through scores of fact finding visits, co-operative planting programs and bamboo variety experiments here in Australia. His thirst for knowledge has led him to China, Thailand, Japan, U.S.A, Costa Rica and many other countries world wide where he has lived and worked on farms in most countries collecting valuable information to share with Australians. He was contracted as a consultant by the Bank of China to assist in the supervision in the planting of a 300 m2 garden of Moso (Phyllostachys pubescens) in the bank’s new headquarters building in Beijing. Such is his global recognition. He has campaigned successfully to educate the populace on the benefits of growing our wonderful environmentally friendly renewable resource. Over an eight year period he conducted some 40 workshops and open days at Belli Park, participated in workshops and acted as a Bamboo consultant within Australia and world wide. This specialist information has proven to be beneficial to all the bamboo enthusiasts with whom he has had contact. It was Durnford Dart and Dr Kerry Walsh of UCQ who initiated and secured funding from RIRDC to collect data that is of benefit to today’s growers. Over the years “Mr Bamboo’s” Bamboo Australia has supplied clumps of bamboo (in excess of 15 metres tall) to the Chadstone Shopping Centre in Melbourne, as part of their refurbishment program, sent full 40ft container of poles from China to the city centre of Berlin where the Melbourne performance group “Bambuco” erected a structure for Aerial performances, procured other similar containers for a performances in Melbourne, Moscow, Singapore, London, Manchester, Antwerp & Lille. He also sold a container of Bamboo curtain rods to a company in Dallas and bamboo fishing poles to Western Samoa. He regularly supplies bamboo poles to the Australian Antarctic expeditions. Following the success of a major flooring installation at the Couran Cove resort he evaluated the demand for Bamboo flooring in Australia to determine the viability of a new business venture. Taking into consideration his Chinese connections and the demand for alternate eco friendly building materials, it was determined that a Bamboo flooring outlet/warehouse would be a viable business if located in an area commensurate with the product. The Flooring Division of Bamboo Australia was established during November 2003. It supplies the imported flooring, bench tops and other associated bamboo products to national distributors and local consumers in ever increasing quantities. Substantial quantities of fresh Bamboo shoots are being seasonally harvested for the Sydney and Melbourne markets. His appointment to conduct a Bamboo Workshop on cultivation and utilisation and then supply Bamboo plants to the participants is indeed an honour and recognition that the QFRI & The Pacific Islands Forests & Tree Support Programme Directors here in Queensland give to the expertise he willingly shares. Workshops relative to all facets of bamboo growing & utilisation continue to take place in conjunction with METI & the Dept of Environment & Agriculture on the Island of Samoa. 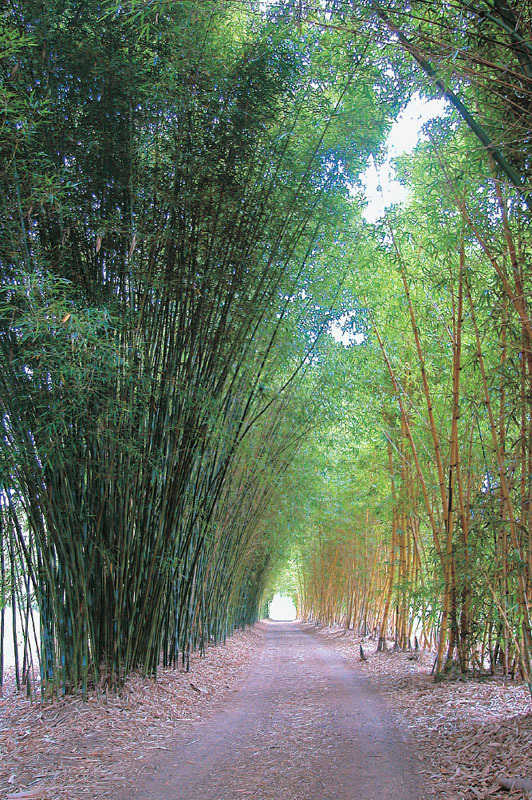 His 130 acre farm has approximately 65 acres of mature (or near mature) bamboo plants consisting of some 250 species. The species selection acts as a gene bank to preserve both common and rare species that are under the threat of extinction in their local Asian environment. The nursery propagates in excess of 50,000 new plants each year, offering the established plants to individual consumers, farmers and landscapers. All activities are self funded, initially from funds received from the sale of the wrecking business and as time progresses by income generated from the farm and importation of bamboo in its natural and manufactured form. As sole director, he enjoys the flexibility and freedom to make decisions without the hindrance of a board of directors or Government/NGO bureaucrats. 1956 – 1962. Served with the Royal Australian Air Force as a cook. 1959. Qualified for unrestricted Private Pilots Licence. 1967 – 1988 Owned and operated own auto recycling business, Bankstown Spare Parts Pty Ltd. Employer of ten staff. Visited Japan regularly collecting car parts. 1989 – Current. Own and operate Bamboo Australia Pty Ltd. employing six staff, growing bamboo nursery stock, harvesting edible shoots, timber poles & foliage from the 250 species planted over 65 acres on the 130 acre farm during the past 21 years. 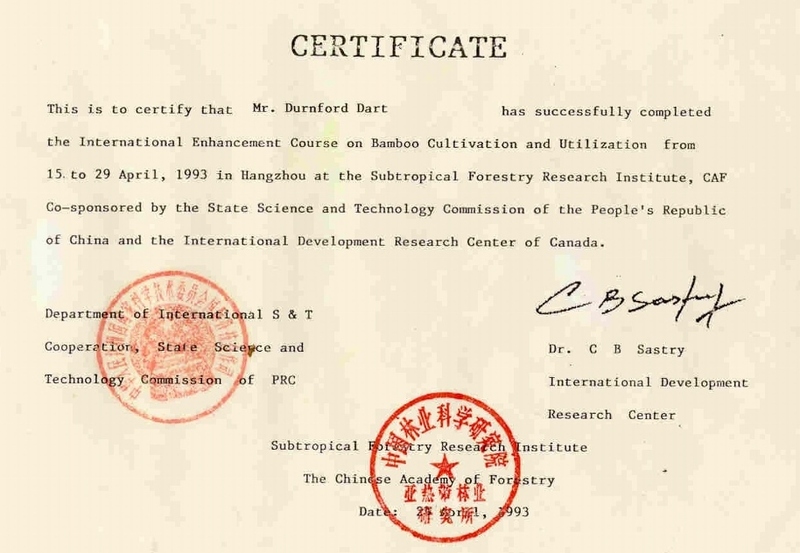 1991 Attended international Bamboo workshops and presented papers relating to bamboo cultivation under Australian growing conditions. 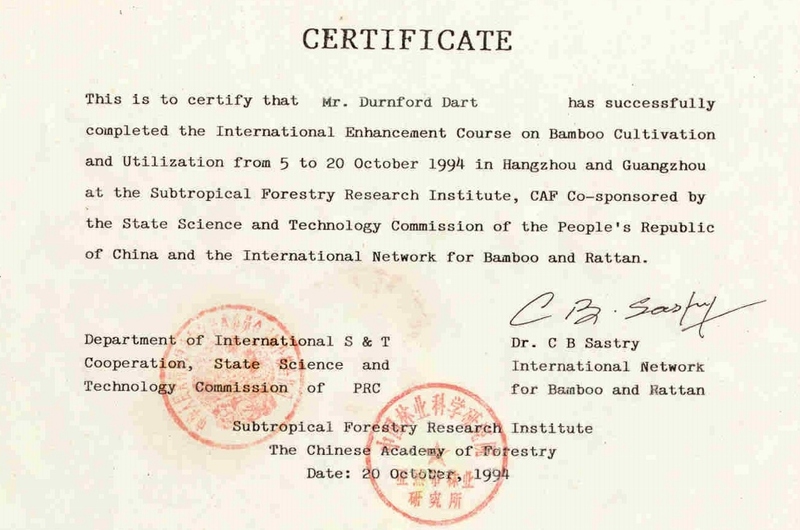 1994 – Attended Enhancement Course on Bamboo Cultivation of Tropical Bamboo Species, Guangzhou Forestry Research Institute, Chinese Academy of Forestry. Guandong. P.R.China. 1992 – 1998 Conducted on farm scientific trials of water and fertiliser application in conjunction with CQU plant sciences Rockhampton. 1997 – Visited South China forestry Institute Nanning, Guangxi. Collect 150 species of tropical bamboo for introduction into Australia. 1999 – Employed as Bamboo Landscaping consultant by the Bank of China for installation of bamboo in the bank’s new Beijing headquarters. Whilst in China invited to present paper “The introduction of bamboo into mainstream agriculture in Australia” Yiyang, Hunan. P.R. China. 1999 – Foundation member of the Asian Vegetable Growers Assn – Queensland Fruit & Vegetable Growers Assn. 2000 – Conducted Cultivation and Utilisation workshop, Cairns. FNQ Organic Growers Assn. 2000 – Conducted Growers Workshop in conjunction with the Organic Growers Assn of the N.T. & another for DPI & F. Coastal Plains Research Station Humpty Doo. N.T. 2000 – Conducted Pacific Island Forests and Tree Support Programme workshop at Belli Park in conjunction with QDPI, AusAid, UNDP & FAO. 2000 – Conducted presentations for the American Bamboo Society, Kona, Hawaii. 2001 – Bamboo specialist on Review Committee member of ACIAR research project, visiting Uni Phillipines plantations in conjunction with CQU who are also doing field trials at Belli Park. 1997 – 2002 Elected Commodore (President) Noosa Yacht & Rowing Club, a club with a membership in excess of 4000. Increased turnover and allocation to sport by 300% over a five year period. 2000 – 2005 Vice President. Bamboo Society of Australia Inc.
2002 – 2006 Three annual presentations for Permaculture Design Institute – Bunya Mountains Qld. 2003 – Elected President of the South East Queensland Bamboo Growers Co-Op Society. 2003 – August 7th to 27th , Invited to present a lecture tour by the American Bamboo Society – Pacific Coastal & Texas Chapters. 2004 – September. Attended the AGM and Bamboo workshop of the American Bamboo Society, Pasadena. California. 2005 – Initiated the development of a Bamboo timber replacement and edible shoot industry in Samoa. 2005 – Feb, Stage one workshop “Introduction & Utilisation” Apia Samoa. Conducted for Dept Forestry and Environment at Vailaema. 2005 – September, Stage two workshop Apia Samoa “Propagation and clump maintrenance” of bamboo. 2006 – February, Hangzhou China. Conduct trials into the manufacture of a waterproof bamboo decking. 2006 – March, Adelaide, South Australia. Discuss potential use of bamboo and arundo donax in the paper pulping/wood chip industry. Visit experimental plantings of donax at Rathdowney Ag college. 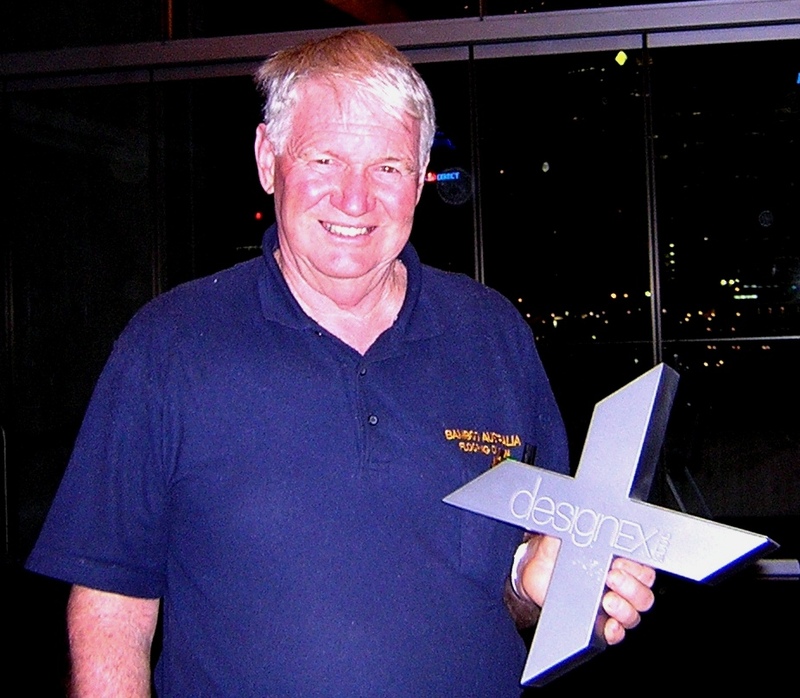 2006 – April, Presentation and display stand at Designex, Sydney Convention Centre. 2006. April, Designex Sydney. Win National trophy for introduction of most innovative new flooring product. 2006 – May. Initial feasibility study/consultancy for Bamboo Rain. LLC .Johannesburg & Cape Town. 2006 – June. Stage three workshop Apia Samoa. “Planting and maintenance of nursery stock”. Trials of salt water preservation for bamboo poles. 2006 – October. Sponsored by the American Bamboo Society to conduct a presentation “Growing Bamboo for Profit” at their AGM in Hilo Hawaii. 2006 – 2007 Hired as a consultant by Bamboo Rain Ltd of Cape Town S. Africa as a consultant to advise species selection of productive bamboo on gold mine tailings in S. Africa and the planting of 25,000 ha of tropical species of bamboo to supply paper pulp mill in East Africa. 2008 Supply and advise on bamboo species for Adelaide zoo’s Pandas. 2009-10. Supply bamboo foliage as feed for Adelaide’s resident Pandas. 2009. Elected International director of the American Bamboo Society for a period of three years. 2011. Established a new company to harvest and process bamboo mulch. 2010. Attended American Bamboo Society AGM Savannah Georgia. Visited several bamboo gardens statewide. 2011. Visited China to determine the viability of producing bamboo charcoal in Australia & source/cost relevant infrastructure. Discussed the production of Bio Char with Prof. Zheke Zhong of the China national Research Centre of Bamboo in Hangzhou. 2011. Visited Western Guandong province to establish a consistent supplier of bamboo fencing and Tonkin cane poles. 2011. Commence feasibility study in conjunction with Qld Dept of Environment & Resource Management for the utilisation of Bamboo as a filtering medium for sewerage effluent in two major country towns/cities. Ongoing. 2012. Contracted by the Bamboo Trading Company of Nairobi in Kenya to conduct a survey to determine the biomass of the native Arudinaria alpina in the Aberdare and Mau regions of Kenya. Hobbies. Sailing, Bamboo species collecting.